I’ve longed for ages for a home where I felt like I could spend the rest of my life. When I moved to Sonoma County, it was the first time I had that feeling about a place. I remember driving home from Santa Rosa on Guerneville Road past green farms, the oak-studded hills before me. Look where I live, I thought. 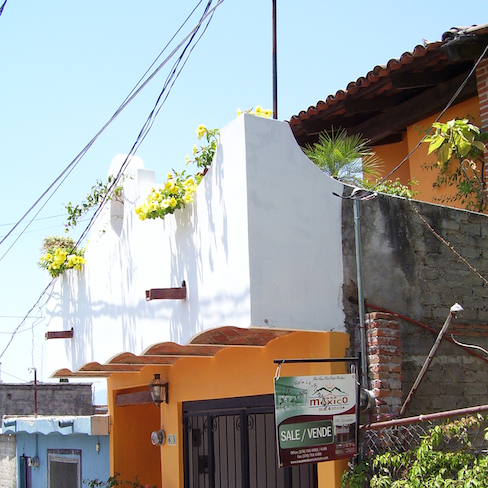 When I moved into La Casa Azul in Todos Santos, it was the first time I had that feeling about an actual dwelling. Things went terribly awry with my landlord there, but I remember that giddy feeling, thinking I’d found the home of my dreams. I remember wondering if I’d be able to negotiate the wrought iron spiral staircase when I grew old. Over the years I’ve built a habit of studying the yards, examining the homes whenever I walk down the street. “Oh, I could live there,” I’d say to myself, caught by the wrap around porch or the climbing wisteria, both pleasure and longing evoked by my ritual, a bittersweet practice. 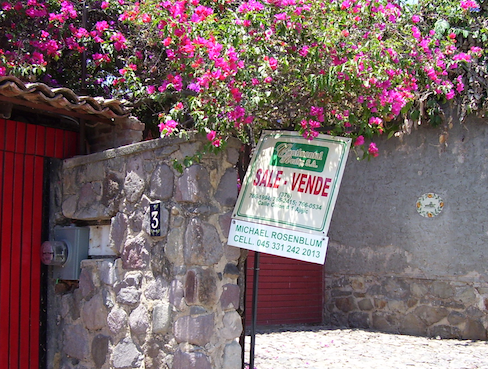 When I lived in Ajijic where buying a home might have been one day more within my reach, I photographed for sale signs. 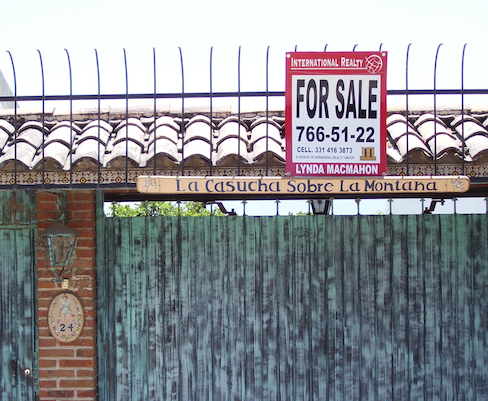 I remember one advertising an empty lot of neatly turned earth, a beautiful brick wall surrounding it, a blue metal gate. I went as far as to look at two homes for sale up in the hills. One was all white and one was green, and they were both two stories tall with miradores that made them seem like three-story homes. I don’t remember any details about the houses themselves, only those marvelous rooftop patios, the views of the village spread out below them, the lake in the distance. I would have lived on those roofs. Now in my unexpected southern California life, thanks to two dear friends and the workings of a generous universe, I’m on the threshold of having my longing met in the old trailer home I’ve just bought. I don’t get to take possession of it, so to speak, until April, but it has possessed me from day one. It has grabbed me by my viscera, invoking big dreams of a magic home I can grow old in, tending my garden and writing my books, the stark place transformed little by little in the intervening years to lushness and color, where my birds will want to linger chatting together in the bougainvillea or the palos verdes. I can see myself sipping tea on my patio there years from now, watching the sun disappear behind my mountains, the sparrows and the mourning doves scritching among the leftover seeds in the late afternoon quiet. I don’t have words to say how grateful I am, how full this makes me, how much awe it awakens. But I seem determined to try anyway, to fall short but maybe brush the feathers of the thing in my attempt. Thank you, universe. Thank you, dwelling gods. Thank you, especially, my good friends. Thank you. This entry was posted in Birds, Daily life, Dreaming, Dreams, Friends, Gratitude, Home, Life, Love, Memory, Mexico, Spanish, Spirituality, Travel and tagged a home where I felt like I could spend the rest of my life, Ajijic, La Casa Azul, Todos Santos, trailer home by Riba. Bookmark the permalink. Depending on he location of the “Old Trailer Home” I have an idea on how to incorporate a free standing miradores with it. We are so glad you decided to make your home here and look forward to seeing all the special touches you will do to make it Riba’s place! I’ve dreamed this same dream of having a mirador one day. I’m not sure if it would be allowed in the park, but it is definitely a part of my long-term ideas for my new home. Loved the last paragraph about the trailer home! Hope it fulfills your every wish! My big thanks to each of you–Madhu, Antonio–for your warm wishes! My thanks for that, as well! Hmmm. I see I overlooked Julie and Marylou and Richard here. So sorry. I so appreciate your good wishes and steady support. Thank you!